5756 EP NEWFOUNDLAND (1897) King Henry VII*. India proof on card. Scott No 74, Yvert No 61. 17816 EP NEWFOUNDLAND (1897) Iceberg*. India proof on card. Scott No 73, Yvert No 60. Rare! 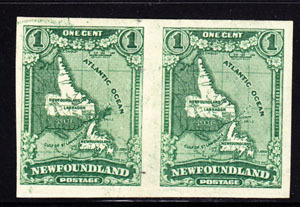 17882 EP NEWFOUNDLAND (1897) Queen Victoria*. India proof on card. Scott No 61, Yvert No 48. Rare! 1596 EP NEWFOUNDLAND (1929) Map of Newfoundland*. Imperforate pair. Scott No 163c. 1619 EP TERRE NEUVE (1932) Baby seal. Imperforate proof pair with control punches from Waterloo & Sons archive (specimens).. Yvert No 181, Scott No 195. 1785 EP NEWFOUNDLAND (1932) Loading iron Ore*. Imperforate proof pair with control punch from Waterlow archives. Scott No 210, Yvert No 183. 10146 EP NEWFOUNDLAND (1932) Salmon*. Imperforate proof pair on thick paper, ungummed as always. Scott No 193, Yvert No 179. Scarce!